The ECO-SE is designed for small engine applications. It also has two unique features. 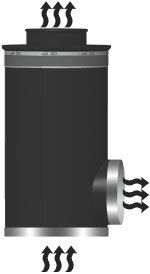 First, it has a urethane outlet tube which allows the filter to be mounted directly to a metal tube or turbo without an additional rubber connection. Second, the standard unit is a straight through air filter, air goes in one end and out the other. Intake adapters are available if you would like to remotely locate the intake. The side inlet version offers additional mounting flexibility.